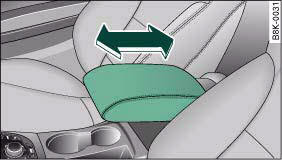 The armrest can be adjusted to several positions and moved back and forwards. – To adjust the position of the armrest, pull the armrest all the way down. – Then lift the armrest gradually until it engages in the desired position. – You can move the armrest backwards or forwards ⇒ fig. 81. Please note that the armrest can restrict the driver's movements when it is lowered. The armrest should therefore be moved back before driving in city traffic. There is a storage compartment underneath the armrest.